i have long wondered about the dutch. 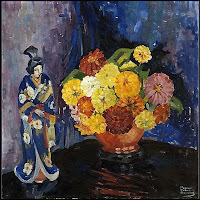 now, we've talked here about twelve dozen times, at least, about the roots of japonisme as having begun after japan was opened to trade in the middle of the 19th century after around 200 years spent in chosen, peaceful, isolation. this gauguin image with a japanese print, for example, is from 1889.
as we've also seen, japanese objects began appearing in artworks before truly inspirational and profound changes were to take place. we know that it wasn't until the end of the nineteenth century that europe began to be flooded with japanese goods, and we even know something of who facilitated the flooding. so then tell me. 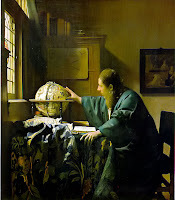 what is this kimono doing in the painting by vermeer??? 'that's not a kimono. it couldn't be,' you will respond. but you would be wrong. "The history of exchange between Japan and the Netherlands started when the Rotterdam ship de Liefde drifted ashore in Japan in 1600. From the end of the 16th to the beginning of the 17th century, during the warring states period, Japanese culture was strongly influenced by Portugal and Spain. "The Dutch VOC envoy left the trading post on the island of Deshima once a year as he was allowed only one visit Edo [Tokyo]. The VOC United East India Company gave exquisite gifts to the Emperor in order to show its gratitude for the trade monopoly privilege. 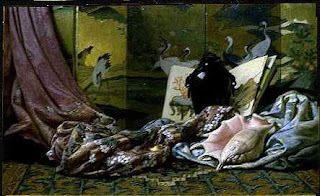 [In return] the very first silk kimono's were a gift from the Japanese emperor to the Dutch envoy. "While artists found limited opportunity to produce the religious iconography which had long been their staple — images of religious subjects were forbidden in the Dutch Reformed Protestant Church — the continuing Northern tradition of detailed realism and hidden symbols appealed to the growing Dutch middle classes, who were replacing Church and State as the principal patrons of art in the Netherlands. 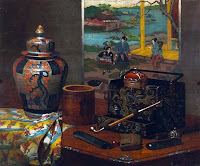 and thus our treats from the dutch: still-lifes, and the very earliest glimpses of japan's cultural riches. 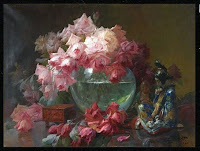 from high-culture to low-, the inclusion of a japanese figurine or print as part of still-life spread across the globe. and we are reminded once again of the eye-opening necessary links between the finest of arts and the bourgeoisie. and again I learn a lot! 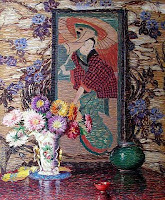 the Vermeer kimono is stunning, I would have never imagined! i know! me neither! except you know what i have been wondering about --it wasn't the kimono, it was the picturing of ordinary people looking ordinary. also a very japanese thing. so i'll see if i can find anything on that at some point. I am also amazed to see the Vermeer kimono! Surely I have seen this before, but never gave it much thought. Wonderful, wonderful post. oh thank you willow. but it's sent me off on some bizarre and even troubling research! The kimono is so elegant that I intend to war it tonight in my dreams. I lived in Holland years ago and loved the cosmopolitan and kind Dutch people. -an unusual combination of character traits. I have an old post on my blog about "The Hotel Pirombo" which is where I lived when I was there. Sorry this is a little off topic but your Dutch post awakened these memories. BTW Did you create your "annex" by making a second blog for it? Or was it more complicated. and it's a second blog. this one is old-school so i can't use some of the fancy updates or widgets, so i have to sort of fake it myself. for some reason it is invariably complicated to update it.